JERRY WIND is Lauder Professor of Marketing and Director of the SEI Center for Advanced Studies in Management at the Wharton School as well as a marketing and business strategy consultant to such companies as Edward Jones & Company, SEI Corporation, and BMS. He is on the boards of a number of dot-com startups. Wind is the author of over 200 articles and eighteen books, including Driving Change: How the Best Companies Are Preparing for the 21st Century. VIJAY MAHAJAN is John P. Harbin Centennial Chair of Business at the College of Business Administration of the University of Texas at Austin, specializing in new product development and diffusion, forecasting, marketing strategy, and marketing research methodologies. The Challenge of Digital Marketing (J. Wind and V. Mahajan). The Digital Technological Environment (T. Ruefli, et al.). Infrastructure for E-Business (R. Kohli). Strategic Uncertainty and the Future of Electronic Consumer Interaction: Developing Scenarios, Adapting Strategies (E. Clemons and S. Bradley). Economic Perspectives on Digital Marketing (A. Barua, et al.). Digital Marketing and the Exchange of Knowledge (T. Davenport and S. Jarvenpaa). CONSUMER BEHAVIOR AND MARKET RESEARCH. Consumer Behavior in Digital Environments (U. Dholakia and R. Bagozzi). The Internet Buyer (D. Reibstein). Rethinking Market Research for the Digital World (R. Burke, et al.). Data Mining Digital Customers (N. Levin and J. Zahavi). Technology-Driven Demand: Implications for the Supply Chain (M. Fisher and D. Reibstein). New Offering Realization in the Networked Digital Environment (S. Balasubramanian, et al.). 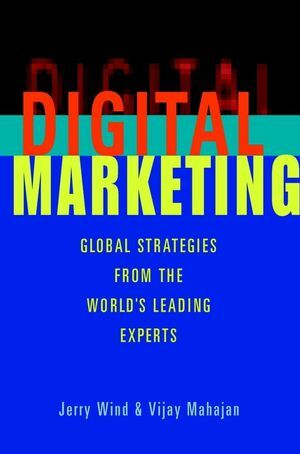 Digital Marketing Communication (J. Deighton and P. Barwise). Pricing Opportunities in the Digital Age (H. Simon and H. Schumann).